Ankle sprains are one of the most common injuries to occur in sports. Understanding ankle sprain treatment is important no matter what sport you participate in. Often, the treatment given within the first 24 hours can speed your return to play by days or even weeks. Previously, we talked about ankle sprains in general, and what to expect from a common ankle sprain. Initial ankle sprain treatment consists of the basic R.I.C.E. principles. Below you will find the specific application of these principles for ankle sprains. The most important part of ankle sprain treatment is controlling the swelling. Many people will tell you that ice is the most important aspect of treatment. While ice is an important part of the overall treatment, compression is the key to controlling swelling. Compression following an ankle sprain can help to control swelling, and can in turn reduce your overall rehabilitation time. As mentioned earlier, swelling is really your body's way of preparing an injury for healing. Known as inflammation, it is necessary...to a certain extent. However, our bodies have a tendency to produce much more of things than we usually need. And while an ankle will swell up quickly, usually within an hour or two of injury, it can takes weeks to remove the swelling after injury. Excessive swelling causes lots of problems, including pain, decreased range of motion, decreased strength, and loss of function. Compressing the area immediately following injury is the key to reducing the swelling and improving your rehabilitation time. Compression for ankle sprain treatment is best achieved using an elastic wrap and a horseshoe pad. The compression wrap and pad should be worn all the time in the first few days following injury, removed only when you are icing and showering. In addition to compression, you should ice your ankle several times a day. This is an important part of ankle sprain treatment in the first 48-72 hours. Ice has several benefits. First, it provides an analgesic effect by reducing pain. Ice helps to reduce the conduction velocity of the nerves in the area that are transmitting pain signals to your brain. This is why you get a "numb" feeling after applying ice to an area. Second, ice helps to reduce the amount of hypoxia, and secondary tissue death. Hypoxia means a lack of oxygen. When your body begins the inflammatory process to start healing, there is a reduced supply of oxygen to the area because of the swelling and injury. There is also an increased need for oxygen beacuse of the healing process that is taking place. With a low supply and high demand, cells begin to die because of the lack of oxygen. Increased cell death results in more inflammation, again, prolonging the healing process. Ice helps to slow the metabolic activity of the cells, thus reducing their need for oxygen. This results in less tissue death. 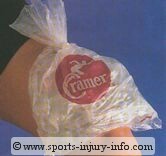 Ice can be applied using ice packs, a cold ice soak, or even using a bag of frozen peas. Applications of 15-20 minutes every hour is appropriate for the first 24-36 hours. After that, icing several times a day will continue to have benefits. Ice and compression together, at the same time, is the best way to treat an ankle initially. The most effective way to achieve this is with an ice compression wrap. 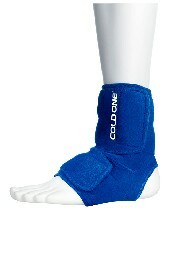 I highly recommend to all of my patients with ankle sprains to use an ice compression wrap if at all possible. They are inexpensive when you think about how much time it can cut off of your rehab, and those expensive visits to my clinic. Rest and elevation are the other basic principles in ankle sprain treatment. Resting your ankle by using crutches and not participating in strenuous activities gives your body time to begin the healing process. Limiting your activities that those that don't increase your pain is a good idea for the first few days following injury. Elevation helps to keep your swelling from increasing by allowing fluid to move towards the heart. In an elevated position, gravity helps to draw fluids towards the heart. Without elevation, gravity tends to pull swelling towards the toes. Ankle sprains are often regarded as a minor injury, however they can have quite an impact on your sports performance. If you suffer an ankle sprain, remember, the RICE principles. Rest, ice, compression, and elevation, with compression and ice being the most important. This basic ankle sprain treatment can reduce your swelling and pain, and is vital to your overall rehabilitation. And as with any type of injury, you should seek medical care from your family physician or certified athletic trainer. It is especially important to seek medical attention immediately if you are unable to bear any weight on your ankle, or if you have severe pain that does not respond to the R.I.C.E. principles. While an ankle sprain is very painful in the first 2-3 days, pain and swelling often subside within a week. After your swelling goes down, you will start to feel better, and probably will want to return to activities as soon as possible. However, even minor ankle sprains should be treated with rehabilitation. Ankle sprains tend to have an additive effect, with each one predisposing you to more frequent and possibly more serious sprains. Rehabilitation exercises to help strengthen the stabilizing muscles of the ankle, as well as helping to restore your balance and proprioception are an important part of ankle sprain treatment even for minor sprains. Talk with your family physician or certified athletic trainer for more information regarding rehabilitation after an ankle sprain. For a complete program to treat your ankle sprain and ankle pain, you not only need strengthening, but mobility and balance exercises as well. If you are suffering from ankle pain or a sprained ankle, this is the program for you. It will walk you step by step through the BEST exercises to treat your ankle pain. An ankle brace may be a good idea if you have suffered from an ankle sprain. I place my patients in an ankle brace after a sprain for the first few months after rehab, just to provide a little support. 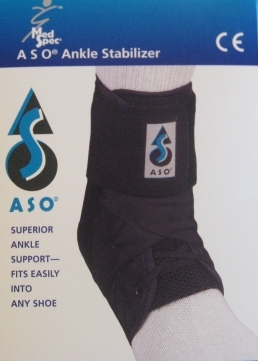 The best brace, and the one that I put my own patients in, is the Ankle Stabilizing Orthosis or ASO. The price ranges from $25-$35 dollars. This is a pretty good deal, considering we sell these braces in the clinic for $50. If it helps prevent another sprain, it is well worth the investment. Ankle sprain treatment centers around controlling your swelling, resting, and then exercises or rehab to restore your strength and balance. An ankle brace is a good idea for returning to sports activities to help provide additional support, and to help prevent re-injury.